Pat Woodward and Mark Richards explore the world of craft beer from their base in Columbus, Ohio. In this episode Hans Gorsuch and Chris Mercerhill join us for an in depth look at one of the World's truly iconic beers, discuss homebrewing with Brett, and get into some American Brett beers (April 2019). 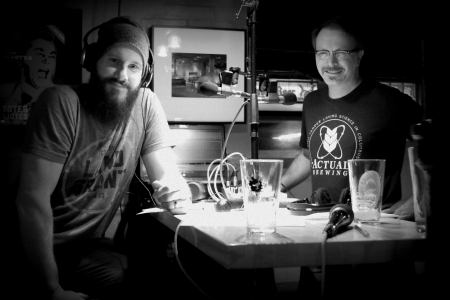 In this episode Tom Ayers of Ill Mannered Brewing in Powell, Ohio joins us for a conversation on neighborhood breweries, yeast management, Australian sparkling ales, Ohio grown ingredients, and more (March 2019). Join us for a voyage into the world of Baltic Porters with award winning homebrewer A.J. Zanyk (February 2019). Hans joins us again as we hop across the English channel to drink Belgian Tripels and Golden Strongs. Join us for tastes and tales of some of the most influential Belgian ales, including Duvel, Westmalle Tripel and Dupont Moinette (July 2018). Mark and I are joined by our friend Hans Gorsuch to drink some British Beers (bitters, IPAs, Imperial Stouts) that I brought back from England. We dissect metal-themed beers, discuss cask ale, and try some beers from smaller scale breweries like Steam Machine and Durham Brewing (March 2018). In this classic episode we go on the road to Athens, Ohio home of Little Fish Brewing. Owners Sean White and Jimmy Stockwell discuss their philosophy to brewing Belgian-inspired farmhouse ales, using local ingredients and the Athens beer scene (Oct 2016). In this archived episode we are joined by Mike Byrne of Lineage Brewing for a discussion of kettle souring, off-flavor tasting, and running a neighborhood brewery (Sept 2016). In this archived episode we sit down with Trevor Williams of Hoof Hearted Brewing to discuss hazy IPAs, the Hoof Hearted Brewpub in Italian Village and Van Halen (March 2016).